Toinen rippikortti, yritin tällä kertaa saada yksinkertaisella layoutilla ja väreillä aikaan pojalle sopivan kortin. 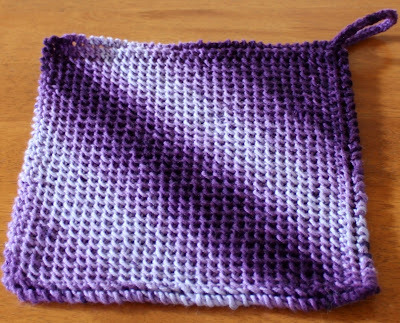 Chinese waves (rav) knitted diagonally with attached i-cord. Varma kesän merkki on tiskirätti tahi pari... Kiinalaisia aaltoja (rav) vinoon neuloen ja i-cordi päähän. Sukkersött #85 calls for embossing, and for once I felt like entering, as I haven't really tried out my embossing gun much since I bought it. 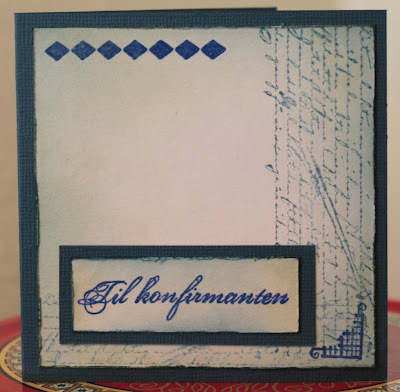 I bought new text stamps in Norwegian from Storyteller, here is a confirmation-card. 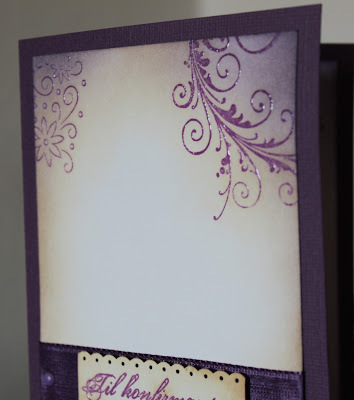 I used VersaColor 157 Amethyst for stamping the embossed bits, and embossed them with Ranger's clear embossing powder. Lupasin bloginamua kun ranteenlämmitinohjeeni sydänmäärä Ravelryssa ylittää tuhannen rajapyykin. 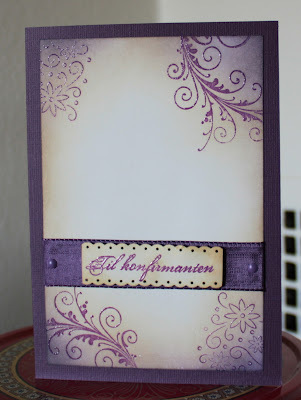 Tässäpä tätä sitten olisi, omien värimieltymysteni mukaan violettia :) En taida muunlaista lankaa enää osata ostaakaan... Kaksi kerää teeteen ihanaista Eleganttia (Ravelry-linkki), omatekoiset silmukkamerkit ja kätevä pikkulaatikko, jossa voi säilyttää vaikka juurikin niitä silmukkamerkkejä, ja sähköisesti ranteenlämmitinohje, mikäli voittajalla sitä ei vielä ole. 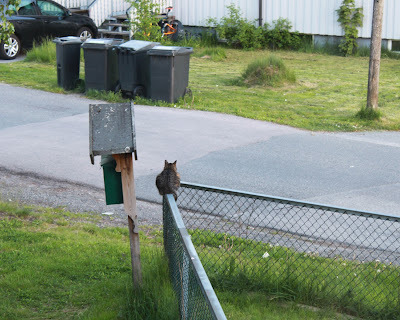 Osallistumaan pääset kommentoimalla tähän postaukseen, osallistumisaikaa 31.5.2010 keskiyöhön Norjan aikaa (Suomi -1 tunti). Voittajan arvon tiistaina 1.6. satunnaislukugeneraattorilla. Muistathan jättää yhteystietosi, eli joko blogin osoite, sähköpostiosoite tai Ravelry-nimesi. Kunhan joku näistä löytyy, voit osallistua, sinun ei siis tarvitse olla Ravelryn jäsen. I promised blog candy when my wristie pattern reaches over 1000 hearts in Ravelry. 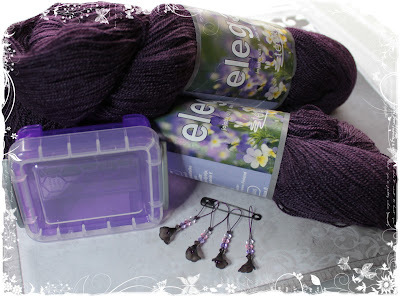 Here it is then, purple, as I apparently cannot buy any other colored yarn these days :D Two skeins of lovely wool-silk from the Finnish teetee called Elegant (rav it) (50g / 500m per skein, 70% wool, 30% tussah-silk, moth-prevention, jojoba oil and aloevera treated), stitch markers made by yours truly and a funny little box for your knitting bag, and my wristie pattern electronically, if the winner does not yet have it. You can participate by commenting on this post, until 31st of May midnight Norwegian time (UTC/GMT +2 hours) and I will draw the winner by random number generator on the 1st of June. 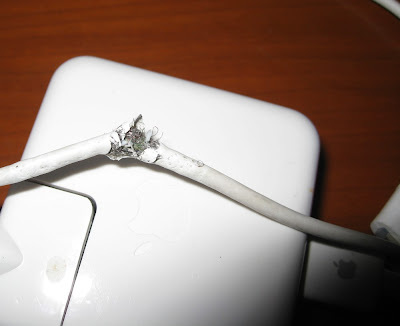 Remember to leave some sort of contact information, a blog address, email address or your Ravelry nick. You do not need to be a Rav-member to participate. 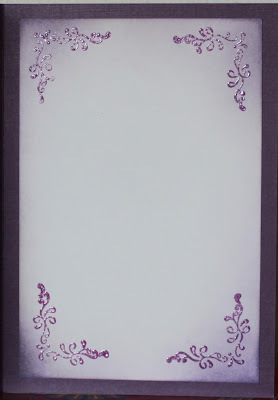 Frame on the image is from the lovely Xtina. 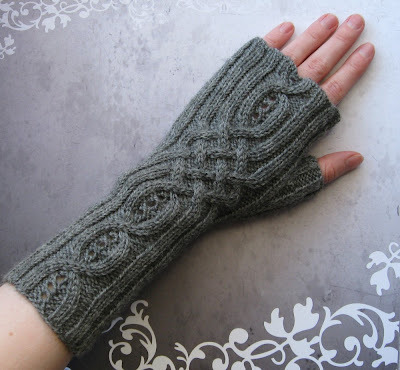 My wristwarmer pattern hit 1.000 hearts in Ravelry today. I've been waiting for this to happen for some time now, since I had decided to have a little blog candy when it happened :) At the moment I am a bit busy with my thesis, so I will postpone the candy for a few weeks, and promise to have it up by the 15th of May. I'll throw in some yarn, candy and whatnot, and of course the pattern if the winner does not have it yet. Open worldwide, and you do not have to be a Ravelry-member to enter (but do join, it's free and fun, although I am not responsible of your exponentially growing time spent browsing patterns, yarns and forums... :) Stay tuned.